May 10, 2010 -- Beam me up, Joe Tucci. 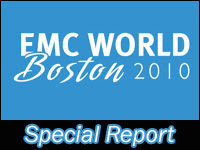 EMC kicked off its "Journey to the Private Cloud" at its 10th annual EMC World conference in here in Boston with another offering upon the altar of virtual storage – EMC VPLEX, a new scale-out architecture that can "teleport" applications from one data center to another. The VPLEX appliance creates scale-out clusters with up to 8 nodes (N+1 and N-1) that EMC says can be dropped into an existing data center, virtualize third-party storage arrays (even the ones made by the "bad guys") and non-disruptively move/relocate virtual machines (VMs), their applications and associated information. For full coverage of the VPLEX product launch, see "EMC Claims Answer for Latency in Global Storage Networks" from sister site Enterprise Storage Forum. I'd love to get some reactions from actual EMC users, but the media has been set up in a comfy ballroom in the hotel next to the convention center for our convenience, of course. We're free to stroll over to the show floor, but that might be a bit tough to do and still make it back in time for the live video feed of the rest of the day's presentations. • There are two versions of the VPLEX appliance available today. 1.) A local configuration for "simplified mobility," meaning technology refreshes and rollovers inside the data center. 2.) The Metro version that connects synchronous data centers over distances of up to 100km. • VPLEX only does block storage, no support for file or object-based storage. • List prices start at $77,000 for a VPLEX local configuration and EMC is also offering a software subscription service for $26,000. • EMC expects revenues for VPLEX to ramp in 2011, but expectations for 2010 are "quite modest." • EMC also claims that their approach with VPLEX is to "really drive standards like SMI-S" – Brian Gallagher, president, EMC's storage virtualization product group…SMI-S? Really? • Pat Gelsinger, president and COO, EMC information infrastructure products said a new version of EMC's FAST (fully automated storage tiering) technology is set to be announced tomorrow.